The primary unmet need for mobile productivity is managing the torrential onslaught of constant communication. Apps and tools that aim to help users “do more” are likely to be self-defeating. On the contrary, we need tools to help us do less. In my last post, I pointed out that the real problem in productivity technology today is that users need ways to seamlessly share information across their cross-discipline teams.I noted that our collaboration tools ironically create more work. Likewise, many mobile productivity tools actually amplify this problem, by reaching users with the most useless notifications from the most tangential acquaintances, at any time of the day. We need to get smarter about what we deliver to mobile users, by properly managing push notifications, intelligently reading user priorities, and helping mobile workers stay focused on what’s important. Smartphones are now the majority of cell phones in the developed world. 58% of Americans , 55% of Canadians, and over 50% of people in Norway, Sweden, Denmark, the UK, and the Netherlands have smartphones. At first glance, we might be tempted to see this shift as just another type of phone. This shift from feature phones to smartphones represents a qualitatively different business landscape and a different set of behaviors. The transition from cellphones to smartphones is not trivial; today’s smartphone has the same computing power as a laptop manufactured as recently as 2006. [*] Smartphones are little computers, while feature phones are simply communication devices. 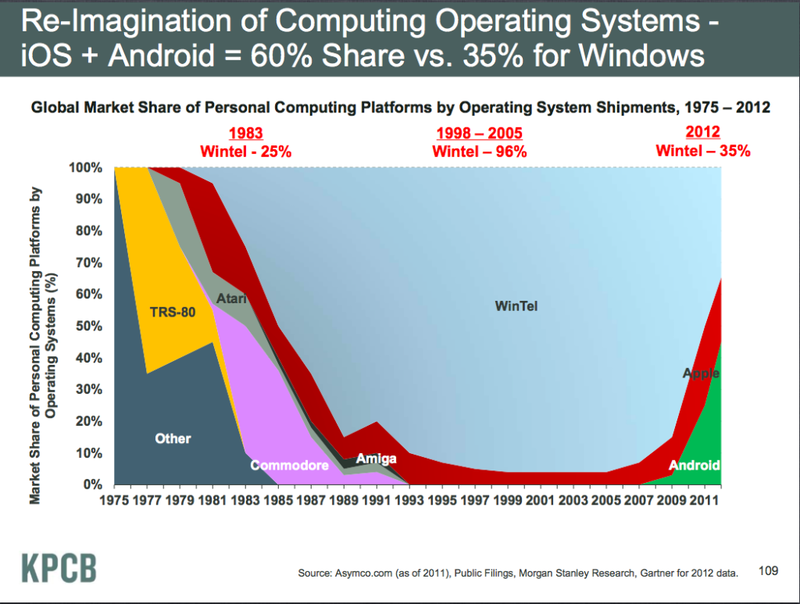 This has clear business implications — as Mary Meeker’s famous operating systems chart shows us. Smartphone growth also has deep implications for everyday behavior. We have rapidly become a society in which the majority of people have tiny computers with them at all times. The majority of people are now constantly receiving email, social media notifications, in addition to phone calls and texts. This means the average smartphone user is now reachable not just to his intimate friends and family, but to even the most casual acquaintance. With feature phones, a typical user could expect to be reachable by her partner, and potentially her boss, or her babysitter. Now she is reachable by an old work colleague, a high school friend, or even someone she has never met but who shares her interest in golf. Having dinner, driving home, or working out at the gym were once private affairs. They are now all susceptible to interruptions. “I had my cellphone in one hand, and it was useless, and my BlackBerry in the other, and it was my lifeline that day,” Ms. Federman recalled. At the time, only about 1 million BlackBerrys were in use, worldwide. Imagine if the same event were to happen today. Millions of tweets would emerge within moments. By way of comparison, the 2014 World Cup final game alone generated 280 million Facebook interactions, and 618,725 tweet PER MINUTE during the game. Clearly mobile technology has already arrived in the workplace — what is this shift doing to productivity? Many of these people use their smartphones for work, regardless of where they are. Technology research company IDC estimates that 900 million workers, 35% of the global workforce, is a “mobile worker,” meaning that they use mobile technologies such as laptops, tablets, or smartphones, for work purposes at least occasionally. In the U.S., at least 72% of workers are mobile. An estimated 174 million people use their smartphones for work purposes. 43% of executives report that they allow employees to work anywhere, on any device they choose and 44% are actively investing in mobile collaborative tools for their employees. Clearly, productivity is changing, but we have very little insight into how and in what ways. Mobile technology makes workers available, wherever and whenever. Researchers have found consistently that mobile technology makes people more available to workplace demands. Research on managers found that they are available to work demands on average 72 hours per week. My own research has shown repeatedly that when workplaces have no policies around expected availability, “always available” becomes the norm. I found that among design workers, 44% reported being available to work demands, during the night while they slept! So is “being available” really the most unmet need for mobile workers? Clearly, mobile productivity today means being able to manage the constant torrent of workplace, personal, and news information. Mixing all these streams together onto a single device makes it difficult for users to discern the importance of any one news item. It also trains workers to expect a constant flow of information, instead of taking regular breaks from the news vortex and actually spending time thinking. At least one new app has found this need and is trying to solve for it. Appfluence attempts to help users separate the “important” from the merely urgent by keeping users focused on their self-defined priorities. Critically, Appfluence isn’t just an app, but integrates into the desktop and mobile spaces equally. We need other tools that synthesize, minimize, and simplify our working lives. We need tools to help us adroitly opt out of availability demands. We need tools to surface only the most significant, and to delete the useless. In short, mobile productivity is not about doing more, but consistently doing less. [*] The BlackBerry Bold 9900, released in 2011, has a 1.2 gHz processor, which would have been the processor speed of the Dell Latitude D420, which was released in 2006. The iPhone 4S has an estimated speed of 800 mHz. Granted, processor speed is not the only measure of computing power. In particular, smartphones are hampered by a lack of reliable network access or slow network speeds. However, the BlackBerry Bold’s processor, given good network access and battery life, can perform as quickly as the Dell Latitude D420 on mundane tasks, such as checking one’s email – a central function we examine in this paper. L. Conrow, “Developing a Taxonomy for Office Email : A Case Study,” Rochester Institute of Technology, 2010. M. Dredze, J. Blitzer, and F. Pereira, “Reply Expectation Prediction for Email Management,” in 2nd Conference on Email and Anti-Spam, 2005, pp. 2–3. F. K. Ozenc and S. D. Farnham, “Life ‘ Modes ’ in Social Media,” in CHI 2011, 2011, pp. 561–570. M. Madden and S. Jones, “Networked Workers,” vol. 2008, no. 24 September. Pew Internet Project, Washington, DC, 2008. O. Turel and A. Serenko, “Is mobile email addiction overlooked?,” Commun. ACM, vol. 53, no. 5, pp. 41–43, 2010. Comscore Inc., “Emal Usage,” New York, N.Y., 2011. Years ago, on a Toronto to Montreal train, my seatmate, an elderly retired engineer pronounced my smart phone an “argument solver”, because you could immediately look up the correct answer to anything…..
That’s one of my favourite uses!